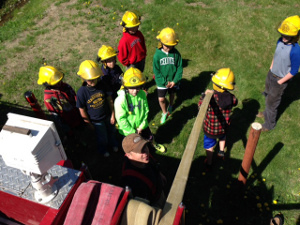 The NewBrook Fire & Rescue Department is justifiably proud of our Juniors Program. The very enthusiastic boys and girls in the Juniors range in age from ten to thirteen and participate in a program that meets every third Sunday. 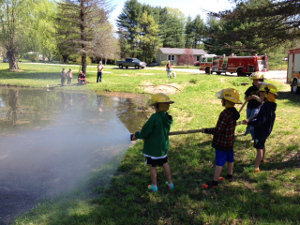 In each session the kids learn a new skill that relates to either the fire or rescue side of EMS. They have learned how to maneuver through a "fake" burning house with a partner, back boarding and spinal immobilization, how to use a fire hose and scene safety,"hands only" CPR, in addition to other rescue training in the field that you will see featured in the images below. 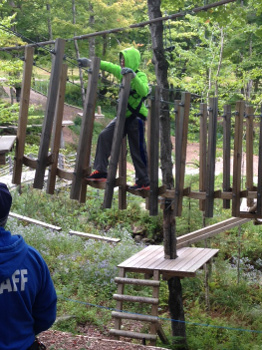 The Juniors are an impressive bunch of young people; they are a very enthusiastic bunch and just love to learn. They work well as a group and take pride in their teamwork. These kids are the future of EMS and we look forward to watching them develop as individuals and as a group. The invaluable efforts of Captain Amie Leavitt, Captain Josh Brookes, Lieutenant Eric Emerson, and Win Clark keep the Juniors program running smoothly and provide interesting and important training for our next generation of New Brook Volunteer Fire and Rescue responders. November 2015 - The Juniors, led by Rescue Inc's Drew Hazelton, practiced their rope and safety equipment skills in a mock rescue drill. 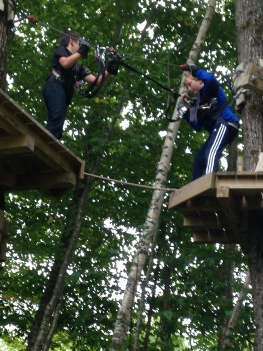 A 'graduate' of the Juniors whose daughter is now a member, Drew is Team Leader of Rescue Inc's High Angle Rescue Team, which is called upon to assist in rescue situations involving highly challenging conditions and terrain in the Southern Vermont area. Juniors get acquainted with the ambulance and equipment at Rescue Inc.